Anechoic chambers are rooms designed to have no reflections from walls causing echoes. Echo free rooms are commonly used in acoustic or sound applications, but can also be applied to radio frequency (RF) applications. 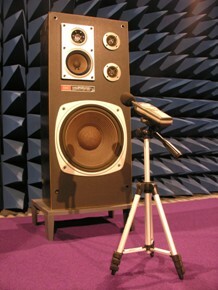 RF anechoic chambers are designed to be free from RF reflections. They are often constructed using pyramidal shaped foam which has been loaded with carbon material. The shape of these foam pyramids also makes them suitable for absorbing sound reflections. RF shielded enclosure housing this absorber material also provides an environment with a low acoustic background. Acoustic anechoic chambers can be used to perform measurements of sound energy emanating from a source without interference from reflections off walls. Commonly performed acoustic measurements include transfer function of a loudspeakers noise radiation from industrial machinery. Our RF anechoic chamber is ideal for the measurements of speaker frequency response as well as sound pressure level (SPL) measurements on various devices.